This tour takes in the highlights of Connemara, Joyces’ Country and Southern Mayo. The start point and your first night’s accommodation is located in the bustling, historic city of Galway, easily reached on public transport from the international airports at Dublin, Knock and Shannon. The first leg of the itinerary takes you to Oughterard, a small town labelled the gateway to Connemara. From there you cycle through the south Connemara countryside to the village of Carna and to the town of Clifden. Leaving Clifden you ride through the Lough Inagh Valley to Leenane on the shores of Killary Harbour. From here you turn east into the Maam Valley and Joyce's country to finish the trip in the quaint village of Cong located on Lough Corrib and location for the film the Quiet Man and home to Ashford Castle (one of Ireland's finest hotels with magnificent park). From here the trip brings you on quiet backroads back to Galway City. Arrive in Galway (there are regular buses from Shannon Airport or trains and buses from Dublin to Galway). Stay the night in a guesthouse in this bustling historic university town. Depending on arrival time we will meet you in the evening or first thing the following morning adjust the bicycle for you and talk you through the week ahead. This is a relatively short day allowing you to spend some more time in Galway. Head out from Galway on the back roads over the hill to near Moycullen continuing to cycle towards Lough Corrib. Near Oughterard stop for a visit of Aughnanure Castle (a norman towerhouse open to the public). The extra loop will allow you some beautiful views over the lake. Stay the night in the small town of Oughterard famed for its fishing on Lough (lake) Corrib. The longer route brings you on a very quiet back road onto a plateau of bogs, moorland, lakes and forests. There are stunning views back over lake Corrib and then onto the Atlantic to the Irish speaking area of Costelloe, from there you turn north and stay along the beautiful south Connemara coast to the village of Kilkieran finishing in the small village of Carna. The shorter version stays inland before joining the coast road after Maam Cross. Continue your cycle along the coast via Roundstone where you can see traditional musical instruments being made by hand. On the way you come past the village of Ballyconneely and the site where Alcock and Brown crash landed their biplane after completing the first transatlantic flight in 1919. There are some very beautiful beaches here. If you still feel energetic after that there is a wonderful a ride out along the Sky Road to enjoy some sublime coastal scenery. The shorter route will bring you over a wonderful bog road. Stay the night in Clifden, this colourful small town is often labelled the metropole of Connemara and you may enjoy traditional Irish music in its pubs. Leave Clifden behind to cycle through the beautiful Lough Inagh Valley to Kylemore, where you may like to visit Kylemore Abbey. From here there are choices to cycle along the coast to Lettergesh or to go a more direct route to Leenane. This small village is located on Killary Harbour, Ireland's only fjord. It was the location for the film "The Field". A beautiful and gentle day in valleys of Connemara and Mayo on very quiet roads, as you cycle along the lakes of Lough Mask, Lough Nafooey and Lough Corrib. Finish in the quaint village of Cong, location for the film "The Quiet Man" with Maureen O'Hara and John Wayne. Visit Cong Abbey founded in the 12th century as well as the Monk's House. Ashford Castle Hotel on the shores of Lough Corrib invites you to enjoy cream tea in its magnificent setting. A last day of cycling and the route brings you on quiet backroads to the small town of Headford passing the wonderful ruin of Ross Errily Friary. 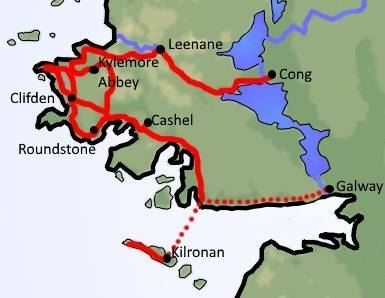 Continue to cyle southwards through the pastoral areas of East Galway before arriving back in the City of the Tribes (as Galway is also called). This tour is suitable for riders of all levels. The route can be modified to suit families with younger children and riders of a more leisurely disposition by shortening the longer distances into half. We recommend flying to Dublin or Shannon airport to reach the starting point of this cycling holiday. The Galway and Connemara cycling holiday includes the daily transfer of luggage to the next hotel and local support if required.